EAST-160. 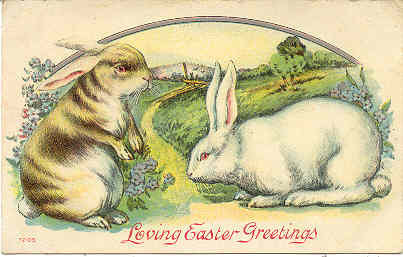 An Excellent Vintage Easter Post Card with a flat surface and Excellent colors. 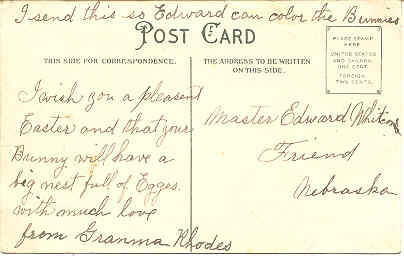 Card has a UDB-UNU with writing on backside addressed to Master Edward Whitcomb, Friend, Nebraska, and in Excellent condition. 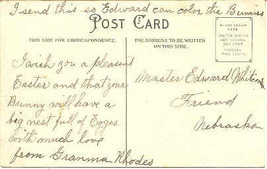 Buyer pays 1.95 S H for U.S. delivery 1st Class Mail. FOREIGN and all other addresses will pay 3.95 S H for 1st Class Mail Int'l Delivery. Discounted S H is available for multiple Post Card purchases as follows; 1st two cards are shipped for 1.95 with a .25 cent fee for each additional card, and all cards must be shipped together at one time. Insurance is the responsibility of the Buyer as all cards are well packaged and I will not be responsible for damage or loss once the card has been shipped. I accept payment by Cashiers Check, Money Order, Personal Check, or Cash. I DO NOT ACCEPT PAY PAL or any sort of Credit Card payments. Cash payments must be in U.S. currency and are remitted at the sole risk of the Buyer.